If you're like most of us, you get inundated with email every day that you might spend as little as 15 seconds looking over to determine how it applies to you. Now, imagine that other people are reading your email the same way. If they can't quickly identify the purpose of your message, they'll probably delete it or leave it in the Inbox for "later" - if later ever comes. 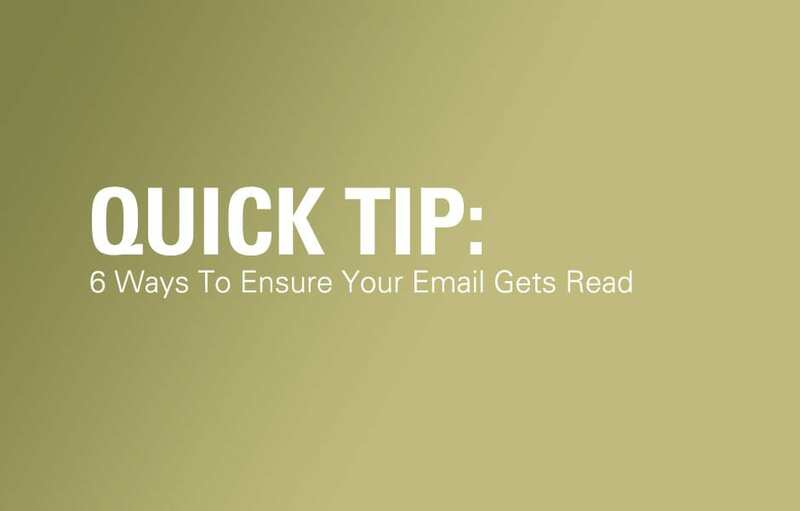 Here are 6 tips to ensure that your emails get read and get the attention they deserve. •A standard subject heading such as "Action Requested," "Response Requested," "FYI," or "Read Only," depending on the action indicated in the body of the message. •The meaningful objective or supporting project that the message relates to, for example, "FY '05 budget forecasting." •The required action if applicable, for example, "Consolidate departmental budget spreadsheets." •The due date if applicable, for example, "Due by July 7." An example of an effective Subject line is "Action Requested - Consolidate all department spreadsheets for FY '06 budget and return to me by June 15th." Make sure you give recipients all of the information they need to complete an action or respond successfully to your request. Your co-workers shouldn't have to come back to you asking for information, whether it is a supporting document or a link to a file on a shared website. You can include supporting information in the body of the message, in an attached file, or in an attached email. In Windows Live Hotmail, you can use the Quick Add feature, which lets you search for and insert content such as images, video, restaurant details, maps, and movie times into your email messages, without ever leaving Hotmail. In addition, if you want recipients to fill out a form, it's a good idea to attach a sample copy of the form that shows how it should be filled out. •Action: The recipient needs to perform an action. For example, "Provide a proposal for a 5% reduction in Travel & Entertainment expense." •Respond: The recipient needs to respond to your message with specific information. For example, "Let me know if you can attend the staff meeting at 9:00 A.M. on Friday." •Read only: The recipient needs to read your message to make sure they understand something. No response is necessary. For example, "Please read the attached sales plan before our next staff meeting on August 12th." •FYI only: The recipient should file your message for future reference. No response is necessary. In fact, even reading the message is optional. For example, "Enclosed for your records are your completed expense reports." •Does this email relate to the recipient's objectives? •Is the recipient responsible for the action in the Subject line? •No action or response should be expected of individuals on the CC line. The recipient needs to only read or file the message. •Only those individuals whose meaningful objectives are affected by the email should be included on the message. If you are not sure that the information is related to a co-worker's objectives, check with that person to see if they want to receive your email on that topic. •Have I clarified purpose and actions? •Have I included supporting documents and written a clear Subject line? •Did I write the message clearly enough that it does not come back to me with questions? •Am I sending the message to the correct recipients? •Have I run the spelling checker and edited the message for grammar and jargon? One of the quickest ways to get onto your recipients' "delete radar" is to overwhelm them with meaningless email. Responding to email with "I got your email, thanks," or sending out lots of irrelevant data that you think they might want to know about is a quick way to create a track record of sending unproductive mail. To summarize, it is incredibly easy to create an unproductive culture using email. Follow these guidelines and you can be sure you and your team are able to keep focused on meaningful objectives and don't create email overload.